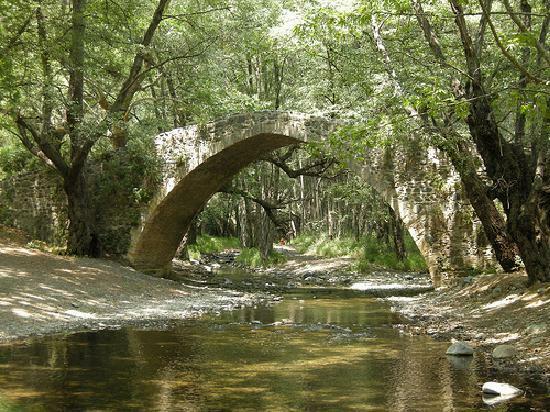 Here is unique opportunity to travel deep inside the Paphos hinterland to explore abandoned villages, deserted monasteries, remote bird habitats, flowing rivers, medieval bridges, dense forests and rich vineyard areas. Our itinerary, which brings you into some of the most undeveloped regions of Cyprus, creates a sort of “mixed meze” of nature and culture experience set against a backdrop of dazzling wilderness in the river valleys of the Troodos foothills. Participants can look forward to great floral displays in spring and superb, almost dream-like landscape the year round. In addition to seeing a range of off-the-beaten-track nature and culture monuments, you will meet spontaneous, friendly village people and have contact with their farm animals (donkeys, goats, cats and dogs). If you wish to get away from the cement-ridden coastline and reach the true heart of unexplored Cyprus, here is your chance! Each excursion includes a very memorable lunch at a small village tavern featuring a variety of vegetarian and non-vegetarian specialties not found in tourist restaurants. We eat what local farmers eat! Sorry, no chips!! Drinking water is provided throughout the day gratis. Special interests: Archaeology, bird-watching, botany, geology, goat manure, human settlement patterns, relief from water urban stress, wine tasting.